Shopping for a new lightweight target arrow for my 31lb recurve. Anyone shooting the inspires? Im currently shooting 27" 1716 with a 85 grain tip and easton st epic 600's. These arrows come in right @ 240 grains. 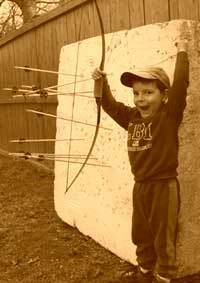 Im thinking if i set up right i can go to 3d shoots with a dozen arrows in my quiver and the whole family can shoot the same arrows. I know, im dreaming right? I tried some in .750 for my 30# target recurve and was not impressed. Least straight - I mean noticable - carbon shaft I have ever seen and only points available are 85 gr. Nibbs. Would look at CX Predators. You could try Gold Tip Warrior shafts. They come spined as low as .700 BUT---they don't use glue in points, so you can have leeway with point weight. Kinda cheap too. God and Christ Bless! I've been shooting the Easton Vectors from my 33# Black Hawk. I only draw 26". Tried both the 1000 and 1400. They fly ok but I still think they're both too stiff. Maybe heavier points but they are glued in and I'm told I can't get heavier tips for them. Been thinking about cutting one off and ordering heavier points. Need to measure the I.D. of the shaft and see what's out there that I can get. Draw back is that the nock end is forming little hairline fractures not having inserts at that end. My go to arrow for my 36# longbow is the carbon express predator ii in .800 spine. I find i bend aluminum too much. These carbons have proven fairly tough and tune very well for my set up. I tried an inspire .900 and a cx predator 800, full length with nibbs @ the kytradfest. They didnt fly well for me. Thinking they needed more weight/cut to length. Just wanted others opinions/experiences. I also thought about a 1616 trimmed to 27" and see how they fly. Zildjian, have you thought about using pin nocks? They require a bushing, but ive been shooting them for the last 6 months or so and love them. Plus if youre a tight group shooter they will save you major bucks in the long run. Brian, be aware that some shoots don't allow nibs. Don't know why, but that's the way it is. Thanks clydebow, most shoots dont allow elevated rests either. I say screw those rules and shoot my equipment for fun. When i outshoot someone, its not normally due to my equipment. Therefore i dont limit myself based on rules. Anyway, with a 30lb bow i need all the advantage i can get just to reach some of those targets,lol. Ive shot full length Inspire 900s with their 50gr nibbs out of a 33# Maddog longbow & 33# 21st Century. I have shot full length Inspire 750s with their 50gr nibbs out of a 36# Toelke Whip and a 35# Wagstaff Pinyon. I've also shot full length Carbon Express Predators in 900 spine with 70gr nibb and full length 800 spine with 70gr nibb out of the same respective bows. I can't tell any difference between the two brands. All of them paper tune to bullet holes. And all of them offer low cost solutions to shaft selection. I wouldn't hesitate to recommend either brand. Thanks kyle, i have some vectors on the way for us to try out. Being new to carbon, I read this thread to help select a spine for target shooting with a 35# recurve. I saw that people were using 750s, 800s, and 900s with bows from 33 to 35 pounds draw weight. I also used the Beman calculator and the Easton chart and they said to use 600s and 630s respectively. I called Beman for some reassurance that 600s were appropriate. The technician used the same calculator and punched in the same data; recurve, 35#, 28" arrow and got the same 600 shaft recommendation. So I bought Easton 630 Inspires at 30 1/2" long and expected to have to shorten them to tune. I painted them up, fletched them, and glued in the 75 grain points. I bare shaft tuned today... stiff! The bare shafts hit 6" on the stiff side at only 10 yards. I can't make them longer, increase the point weight, or thin the arrow plate. I could raise the brace a little, but that is not going to make a significant difference. I'll have to rely on the 3" fletching to straighten them out. So if you are drawing around 35#, try the 800s. @ my 31# bow weight the easton vector 1000 is really doing me well.